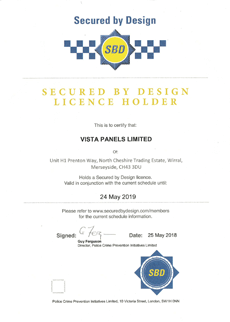 Vista is an accredited door supplier, supplying many tradesmen across the UK with high quality uPVC and composite doors. We ensure that every door is manufactured to all of the latest industry standards, so that you can be confident when it comes to specifying a product to your customers. See below for a list of our accreditations. Secured by Design (SBD) – is a consumer recognised police initiative to improve security measures in homes across the UK. As security becomes a major deciding factor when buying new windows or doors, homeowners look to Secured by Design products to achieve this. Our composite doors can meet SBD standards. 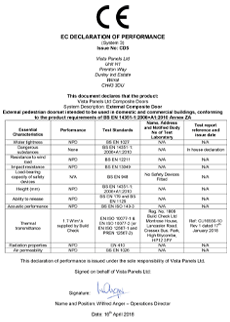 Q-Mark – Vista composite doors comply with Document Q certification (when ordered with the appropriate upgrades). CE marking – The company responsible for CE Marking is the company that brings the complete product to market. Our uPVC panels are supplied glazed but without hardware so you are responsible for CE Marking these. However we can supply complete composite doors and composite fire doors so you don’t have to worry about having these CE Marked.